Sky Blue Credit Review - Best Credit Repair Service or Scam? Sky Blue Credit has been in business for 29 years. As a result, they have developed a solid reputation for providing quality results at an affordable price. Above all, they pride themselves on providing excellent customer service and faster results than the competition. The company has analyzed the different methods of disputing credit items and has determined which are the most effective. As a result, by applying these methods, and by focusing its service techniques around them, the firm believes it has found a winning formula. As a result, a formula for achieving the best possible results in a timely and cost-effective manner. What Makes Sky Blue A Good Option For Credit Repair? Fast Results - Sky Blue Credit understands the urgency behind credit repair. A poor credit score can have a negative effect on things such as a mortgage application, interest rates on loans, and much more. They pride themselves on having the fastest service in the industry. In addition, claim to offer their clients 15 credit item disputes per 35 days (5 for each bureau). Expert Advice - Sky Blue will analyze your credit report and give you specific action-steps that you can take to help improve your credit score. The Pro Advantage - Their team of experts will analyze every detail of your credit report to identify possible reporting errors and hard-to-spot compliance issues. These could be crippling your credit score. Satisfaction Guaranteed - Sky Blue Credit offers customers a fantastic 90-day guarantee. If you're not satisfied for any reason during the first 90 days of your membership, just tell them why and you will get a full refund. Customized Approach - This company doesn't offer a cookie-cutter solution to credit repair like other companies do. They understand that each client's needs are different, and they therefore build a customized solution and approach that is tailored to your credit situation. How Much Does Sky Blue Credit Cost For Credit Repair? The cost of service for Sky Blue Credit is $79 per month ($119/mo. for couples). This is right in line and similar to other services within the industry. But the differences between Sky Blue and other credit repair companies are that they only charge as work is completed and never in advance. The ability to "pay as you go" is an attractive feature that separates Sky Blue Credit from the competition. You can cancel your service at any time and have no further obligation. And don't worry, there are no termination fees or penalties either. In addition, Sky Blue Credit offers additional services above and beyond simple credit repair. Debt validation. This is a strategy to pursue if you do plan to pay your debt — or if you think the debt does not actually belong to you. You have the right to validate a collection letter within 30 days of receiving it. Goodwill letters. These are appeals to creditors to remove certain events from your credit history. It is best to use goodwill letters on isolated payments (more than six months due). Cease and desist letters. These are official notifications to debt collectors to stop communicating with you. Before sending, the Sky Blue team will help you research the statute of limitation for the debt and validate the debt if this is an option. Debt settlement/negotiation consultations. If you do decide to pay your debt, there's a chance you'll be able to negotiate the amount. Sky Blue can help you with this. 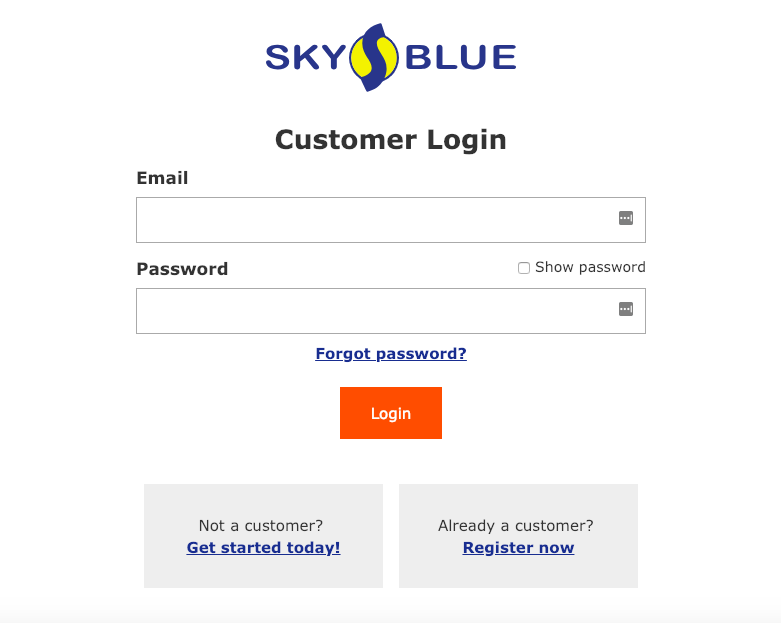 In addition, Sky Blue has an online portal for its customers. The portal is offered on desktop and mobile, offers strong security, and allows you to track your progress. As financial technologies evolve, being fluent in navigating an online service is critical to success — and Sky Blue helps new customers come up to speed. 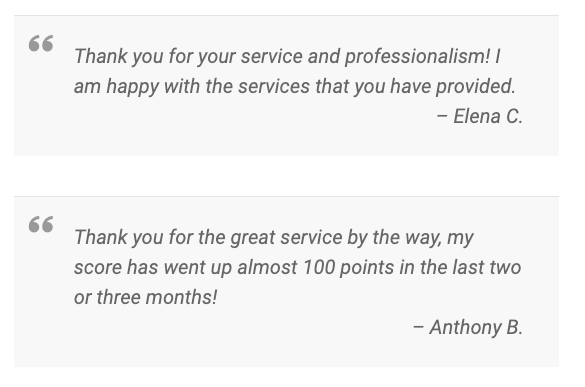 According to reviews left by past customers, most clients were very impressed with their results, with several of them claiming to have increased their FICO scores by up to 100 points. Their "excellent customer service" was also a common theme among the Sky Blue reviews that we analyzed. Is Sky Blue Credit Worth It? In our opinion, Sky Blue is definitely worth the price for the results that they deliver. The pay-as-you-go pricing structure and fast results are attractive features, but the rock-solid guarantee is what really makes the decision a no-brainer. With over 29 years of experience, it's difficult to go wrong with choosing Sky Blue's credit repair service. Sky Blue’s list of licenses put me at ease when hiring them to fight on my behalf. Because I was already fighting credit fraud, I feared being tricked again. Their list of credentials made me feel confident in their services. Providing a great Christmas for three kids is expensive. I got behind on bills, and my credit suffered tremendously. Sky Blue Credit helped me get back on my feet, and I’m truly thankful I turned to them! confidence, thanks to Sky Blue! Sky Blue credit repair provided a payoff schedule that was simple and easy to implement! Nothing makes the process of paying off debt easier than having specific dates and numbers on the calendar. They will also send reminders! I was humiliated that I had to run to sky blue for credit repair help, but they were professional and made me feel like I wasn’t alone. It’s reassuring to know you aren’t the only one struggling. I never thought that a few school loans would affect my ability to change my cell phone provider. Needless to say, I was only qualified for a prepaid month-to-month contract. Not only was I really humiliated, but after chatting my options over with an associated, I also realized that these contracts are more expensive. Thus, my pride and wallet suffered tremendously. Fearing the worst, I contacted Sky Blue for help, and they’ve been my biggest advocate ever since. My score as already increased, and I’m thrilled to say that my credit will likely not cause me any more serious inconveniences in the future. I’m hopeful that once my month-to-month billing cycle ends, I can waltz back into the office that denied me cell coverage, and regain a bit of the pride I lost. I appreciate all of sky blue credit’s help and support while trying to repair my financial history. I’m a living example that they provide the best service regardless of the severity of the case. This is the best credit repair company out there. Really happy with this. I wanted to see if your company can help me. I only have 4 negative items that needs to be removed. I have been fighting with the companies for almost 2 years now. Thanks for this review about Sky Blue Credit Repair. We've been trying to secure a mortgage for a home and our credit score isn't quite where it need to be but we're going to give Sky Blue a try based on your review. Thanks for the free information guys!